About our new music. One thing we take pride in is bringing joy to others. This is something we keep in mind when we create music. We believe bringing happiness helps to uplift which is important to us. If you've ever been to one of our live shows you've seen this in full effect. This new record is more of what we've already given you. If we can help bring happiness for just a moment then we know we have had an impact. We try doing this mostly by being an example. 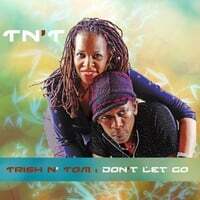 When you hear, see, meet TN'T(Trish N' Tom) we want you to think love and happiness. Of course we're not perfect, but who is. So we put these things we've mentioned in the music. This new music is fun and exciting. It's fast, it's slow, in between, positive, uplifting and guaranteed to keep you awake. We dig all types of musical genres so we cover quite a bit. Most importantly, this is good good music. So even if it's not your preference, we hope that you will be able to appreciate.